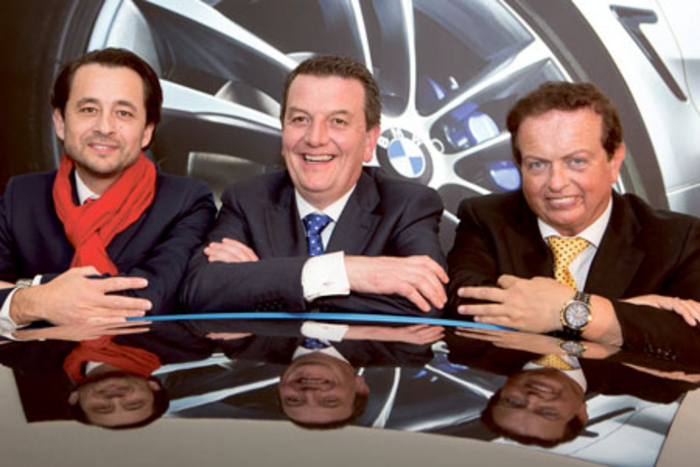 Paolo Alvez, managing director, BMW Ireland; Colm Quinnl; and RTÉ Sports presenter, Marty Morrissey pictured at the launch of the new state-of-the-art Colm Quinn BMW showroom in Galway. Colm Quinn BMW Galway has created 25 new jobs. Colm Quinn BMW has created 25 new jobs at its new BMW dealership in Galway. The new dealership, which brings BMW back to Galway following a five year absence, has employed 14 fulltime staff in the last 12 months and will recruit 11 more fulltime employees over the next month. The purpose-built BMW dealership located on the Tuam Road in Galway is Colm Quinn’s second facility with Colm Quinn Athlone in operation since 2008. With the additional employment in Galway, the group will employ 80 people in total across both branches. “We have some exciting plans for 2015 including the opening of a roof-top putting green for our customers. We already offer full corporate facilities including public wifi, work stations and private offices - we’re looking forward to enhancing the customer experience even more during the next year,” concluded Colm. Colm Quinn Galway will offer new BMW vehicle purchases as well as ‘BMW Premium Selection Approved Used Cars and MINI Cherished Car Sales’ which can also be financed through BMW Financial Services. Contract hire as well as servicing, tyre and body repairs are also available at the state-of-the-art dealership.